We are still offering paper-based testing at all our locations but are also now offering Computer-delivered IELTS testing in Ottawa. Since 1989, IELTS has been trusted worldwide and has proven to provide a secure, global, authentic and customer-focused test which measures true to life ability to communicate in English. Over 9,000 educational institutions, government agencies and professional organizations in more than 140 countries around the world recognize IELTS scores as a trusted and valid indicator of ability to communicate in English. In Canada, IELTS is used as a measure of English language proficiency for citizenship, Permanent Residence applications, immigration, skilled worker applications, university entrance requirements, Masters degree programs, and other professional designations. With over 3 million tests taken in the past year, IELTS is the world’s most popular high-stakes English language test, accepted for study, work, and migration. IELTS sets the standard for integrity, research, and innovation. The Academic Module is used to assess a candidate’s readiness to study in post-secondary institutions where English is the medium of instruction. Professional Registration Organizations often request the IELTS Academic Module. The General Module is used to assess the general proficiency of candidates wishing to complete secondary school, a training program, or to gain work experience in an English speaking environment. 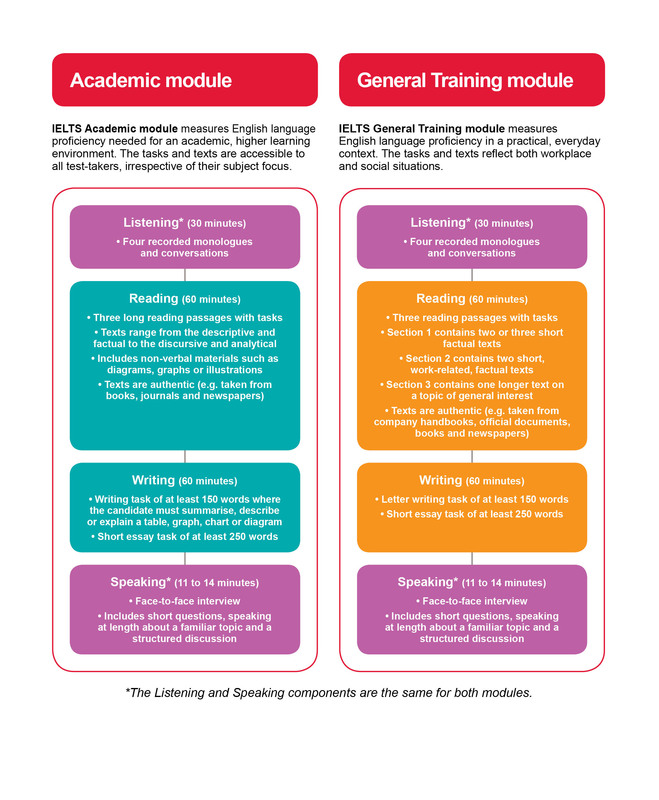 The General Module is also used to assess language proficiency for immigration to Canada, Australia and New Zealand. When in doubt, it is the candidate’s responsibility to contact their Recognizing Organization to determine which module is required.